[[AirTran]] has announced a new $15 fee for the first checked bag. The fee will affect all tickets booked on or after November 12 (which just happens to be today—so much for advance warning) for travel on or after December 5. If that latter date sounds familiar, that’s probably because Delta’s new first-bag fee takes effect the same day. Coincidence? I’ll get back to that. Remember when first-checked-bag fees were controversial? Yeah, me neither. Welcome to the new status quo. Our Ultimate Guide to Airline Fees now has a mere four carriers without first-checked-bag fees. The honor roll: [[Alaska Airlines | Alaska]], [[JetBlue Airways | JetBlue]], [[Southwest Airlines | Southwest]], and [[Virgin America]]. Now, back to that “coincidence.” My sense is that AirTran was waiting all along to see what [[Delta Air Lines | Delta]] would do. The two airlines are fierce competitors, each with major hubs in Atlanta. Considering Delta’s newfound clout thanks to its merger with [[Northwest]] and the existing rivalry between AirTran and Delta, my guess is AirTran made this move to stay as competitive as possible. Take that for what it’s worth. Back when [[Frontier Airlines | Frontier]] announced its first-bag fee, I started an informal prediction contest to see who would be next. I was sort of right (I said “probably Delta”), but didn’t have time to make another prediction (though AirTran was on my short list of possibilities). But enough about my amazing powers of prognostication—who will be next this time? (My pick is Alaska.) Is there any hope for the four remaining carriers to continue holding out? Will all of our major airlines charge for the first bag by the end of the year? Or will one be left standing among the rubble? 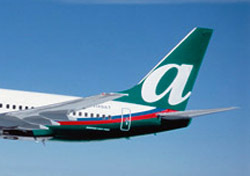 Leave a comment below with your guess, and any thoughts you have on AirTran’s new fee.